This time the Push Button. The button grew when it had focus in the light theme, this was fixed. 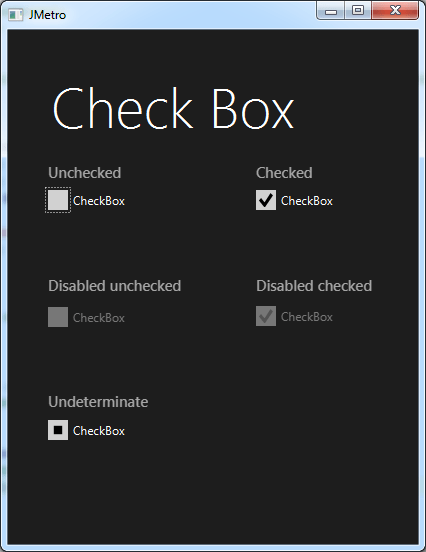 I’ve also fixed several issues with the CheckBox styling. Below you can see the CheckBox with jmetro Dark Theme (which I didn’t show before in the CheckBox post). Finally I’ve created a new project under the directory jmetro8. Stylesheets that work someway on java8 will work differently on javafx2, so because of this the folder jmetro will have the old stylesheets targeted at javafx2 and the folder jmetro8 will have the new stylesheets (the ones mentioned in my earlier posts) targeted at java8.